Poor Mojo's Classic Squid: Squid "Ask The Giant Squid: The Giant Squid presents MonkeyZen, grouping the second, item one of three "
I now in this week return to my second apportionment of my latest public work: the general elevation of the level of human cultural discourse. So,then, in the absence of further delay, permit me to make presentation of the latest of installment of the continuing adventures of our own MonkeyZen. Panel the First: We confront MonkeyZen, viewing him from his waist upward. He stares out upon us, his mighty side-arm held aloft (in, I once again note, the leftmost hand.) His rightmost arm is bent for action, though still at his side. Panel the Second: Our perspective on MonkeyZen has zoomed-the-in, somewhat, as well as panning to the stage left. We can no longer view his rightmost manipulator at all, and the leftmost arm— the "gun to toting" arm— is nigh into center in our field of views. Additionally, has not MonkeyZen's attitude changed? Does he not gaze downward, now, a look of concern, consternation, even shame gracing his noble simian visage? 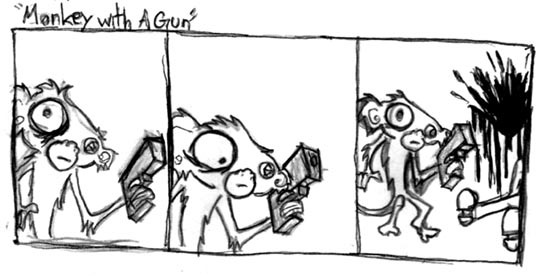 Panel the Third: Now the perspective has zoomed fully to out, and we see the trouble that the monkey-with-a-gun hath wrought: two feets project form the leftern edge of the frame, the wall is blood-bedecked, and MonkeyZen— his firearm held aloft— bears a face filled with either shock, menace, or primatal ennui. Still, that right-side manipulator, it remains unmoving at the side, almost slack. Brief Interpretation: I find now, on this occasion, again any artistic depiction of a primate is, in truth, a playing-outward of the pre-historical Judeao-Christo-Muslim passion play of the two brothers Cain (the Sinister Brother) and Abel (the Dexter Brother), their mutual attempt to curry the favor of their Blood-God, and the left-handed results. Good to recall that it is with the rightmost hand that Cain drew his brother close in embrace, and the leftmost hand with which he slew him. In this light, we can clearly see how MonkeyZen, in his singular form, combines the dual nature of brothers sinister and dextrous. In Panel the First, there is clearly equal balance between forces of the right and forces of the left— perhaps, even, the right-loving hand might still arrest the action of the left-killing hand. In the Middlemost Panel we find that the right-hand, the peace-hand, the love-hand, the dextrous-hand, has been cut from the scene entirely, and thus can lend no aid to the will-be victim. By Panel the Final, we see that the sinister hand has taken sway, and the righter hand, the hand of correction and constance, can only hang impotently at MonkeyZen's side. The damages have been wrought, with the greater part of the corpus monkeyzenicum having no say in this tragedy. To be sure, a certain Sang takes some great umbrage with this interpretation, noting that, for all that may be seen in these panels, there was never a chance for the dexter-hand to spoil the nefarious plans of the sinister-hand. It would seem that, from Panel the First, the victim was already of the dead. There are disasters that no good will can undo, and we do mauvely weep for our brother-with-arms. Should a monkey be armed, and take up those arms thus roiling a sea of trouble, on who should we lay blame for that destruction? Charlatan Heston of the Greater American Association for the Wielding of Firearms stated it best when he uttered "Guns do not make the killing of peoples; damned dirty apes make for the killing of peoples."